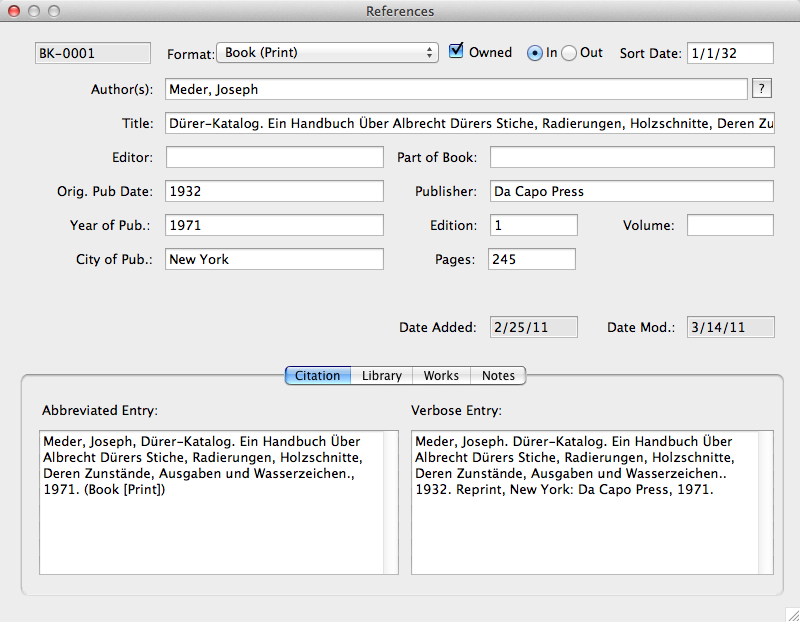 In the References module, one can automatically create Exhibition and Bibliographic citations and link them to associated artworks. 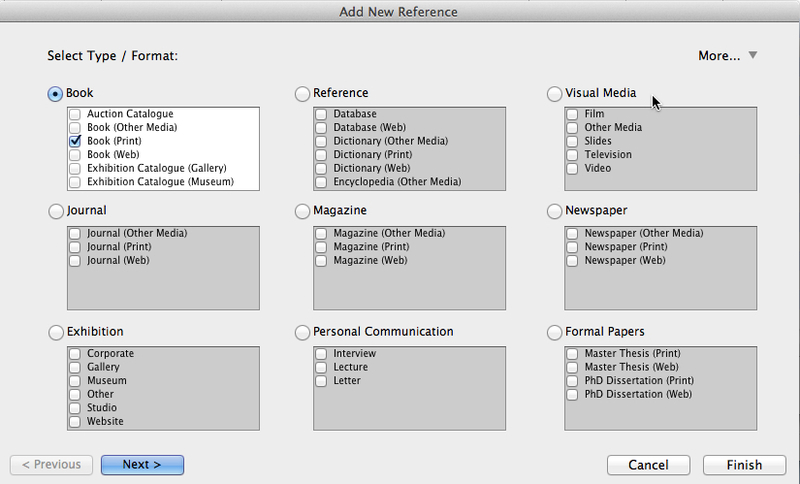 Choose from 39 specialized types of references for Book, Journal, Exhibition, Magazine, and other categories (at left). When a Reference record is filled out, Pro automatically converts the data to industry-standard `Chicago Style' citations. These are added automatically to Artsystems Pro’s standard Information Sheet and other customized document templates for each linked work. The Infosheet shows basic caption information for the work as well as Provenance (or collection history), Exhibition History, and Bibliography — in the correct format, ready to print for presentation. The top half of the References form asks for specialized information relating to the type of reference to be recorded. Upon entering the information and saving a record, correct Verbose and Abbreviated Citations (adjacent example) are automatically formatted and are generated in Artsystems work Infosheets and other documents. Infosheets can also display in Artsystems WebManager websites, and ProFile mobile app. 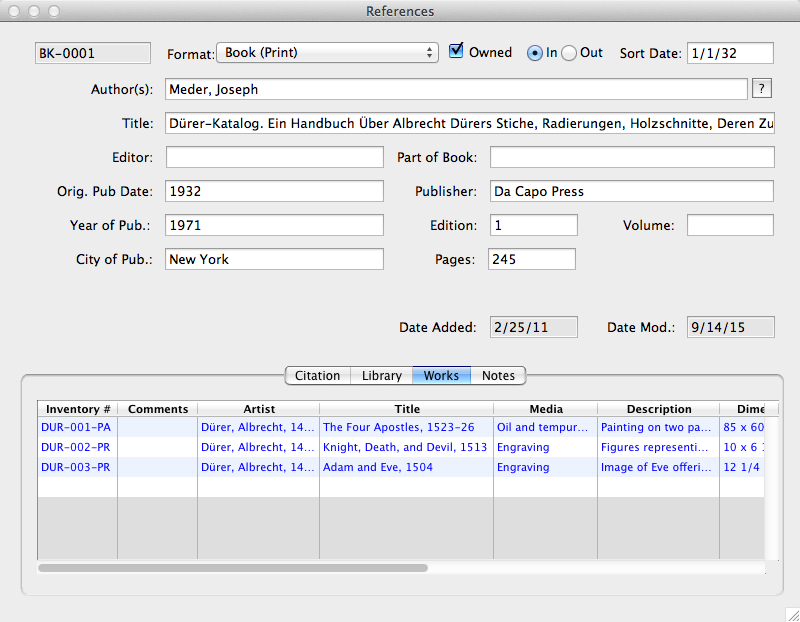 In the References module's Works section, the formatted work reference citations can quickly be added to multiple works. Select relevant works directly from a pop-up look-up list. Related records are automatically cross linked — click to go to the linked work record to view all the pertinent information about the work, and review the work's exhibition history and bibliography in the work's References tab. From there, you also can review, access, and add additional Reference citations to the work. In the Library section, one can enter pertinent information about physical copies of the items that contain the work references, as well as any other items in your library that you wish to record and track. 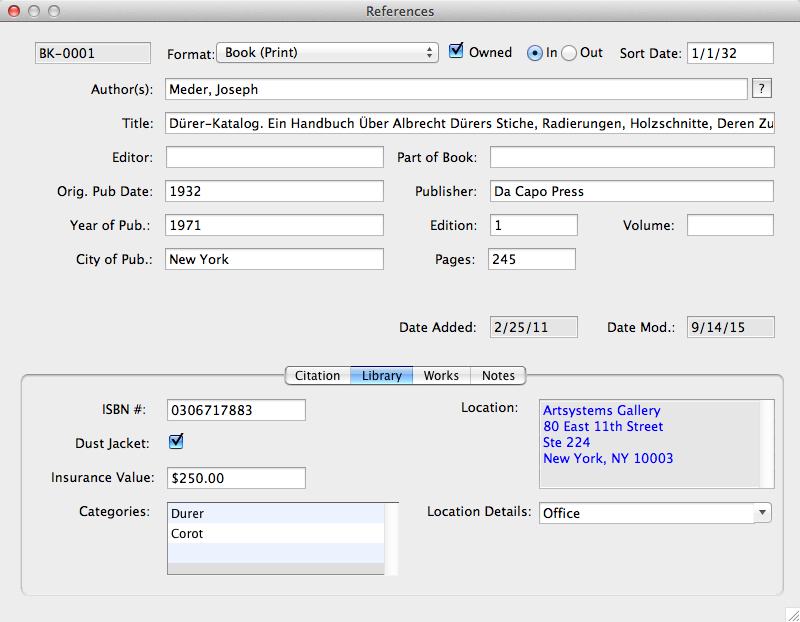 Enter the location of a book, periodical, video, or document and whether it has been loaned out. The insurance value for each item in the library can also be recorded.